The GT Coupe is a must see! May 2018, brought the completion of LIFE PROOF BOATS first ever GT COUPE. A sleek stylish 31’ vessel designed to compete heavy in the pleasure craft market. With a 3/4 cabin style (optional canvas bulkhead) the cabin space of the boat is open and inviting. The interior space is smart in its ability to be reconfigured for entertaining under the shade of the roof or open to the outdoors on the rear deck of the boat. Its fundamental features allow this boat to fit a wide range of boating lifestyle choices. There are 3 optional configurations of the space behind the driver seat which allow the design of the boat to fit a galley, a 3rd suspension seat, or 2 additional bench seats. With the 2 additional bench seats there is room for 8 in the main cabin, and an additional 4 outside on the rear bench seat. The cuddy interior offers opposing bench’s giving 6’7” of lay down length and with the center drop in filler panels the cuddy space is transformed into a single large berthing space. When nature calls there is also a full electric macerating toilet located on the port side of the cuddy. 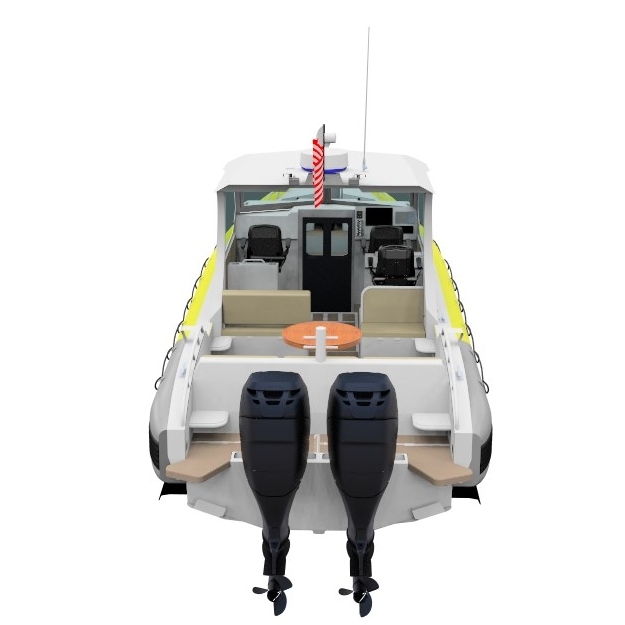 Other key features that make this boat stand out, is the optional drop bow door, in deck fish boxes, optional FLIR camera, and designed to incorporate the very best in suspension seating. And for the fisherman out there, two Burnewiin universal accessory mounts are included in the base boat. They work great for grilling out as well since they double as a BBQ mount. The GT Coupe Model starts at $300,000 and with options like paint, synthetic teak decking, and joystick piloting pricing can reach over $400,000. Already announcing a handful of new models for 2018, Life Proof Boats is pleased to announce another model has finished the design phase is green lighted to start production first quarter of 2018. This project code named the "GT Coupe" is targeting a market of clients who love the feeling of a open cabin boat (no rear bulkhead) but have the option of snapping in a canvas enclosure to create a closed cabin compartment for those raining or cold days on the water. Lounging and entertaining guests is also a major focal point for this design driving a flush cabin deck and lots of seating options. This first production model will feature three suspension seats but available options for cabin layouts will offer an additional bench seat in lieu of the rear suspension seat. Interacting with the water is our class leading 22 degree, fine entry 31FT hull. Outfitted with twin 350HP outboards this boat will see speeds on the boarder line of 60mph. With Suzuki's new dual prop 350HP outboards and gear ratio you should easily be able to push this boat beyond the 60mph mark. Available with our signature drop bow door, and fold out ladder. This is sure a boat that will favor well with any boater looking to do some exploring. The list of amenities available is more than the fair share for the average boater. A flushing head, is standard on all models and the cuddy cabin berth is large enough to easily accommodate two adults overnight in comfort. Come find us at the 2018 Seattle Boat Show to find out more details. We are proud to announce the launching of our new diesel inboard center console line. With the heart of the platform in the form of a 6.6L Duramax Diesel putting out 500HP, and delivering the power through a Hamilton waterjet. At just under 6,300 lbs wet, the incredible power to weight ratio allows the boat to achieve sprint speeds in excess of 50 MPH. This is one of the first of many following high profile aluminum RIB's that will change the way the marine industry looks at RIB's. That is because it incorporates our new hybrid collar technology. With 20% air and 80% foam in the collar, your senses will tell you this is a typical inflatable. But the zipper running the whole length of the collar is a giveaway there is more to this boat. The zipper system gives the user ultimate control over servicing the collar. It is a game changer for the amount of control it gives the user in the event the separate, internal bladder is compromised. Because the other collar materials only protect the internal bladder from abrasion and UV rays, the lifespan of the collar itself is increased far beyond a conventional RIB. Also incorporated into the platform are the latest military grade suspension seats from Shockwave. The S3 mid back drop down seats incorporate 8" of suspension via Fox Float H2O shocks. And with the optional seat height adjustment package and drop down bolster seat, they allow the user to have the ultimate comfort in either a seated or standing position. While the displacement might be identical to your on road GMC pickup this engine has been massaged to give more power and handle the harsh marine environment. Coupled to a ZF transmission with optional push-button transmission selection and a drive line from Portland Drives lines, this power plant is incredibly quite and responsive. With one of the most remarkable aspects of the engine being its fuel economy, cruise on the platform seams to be around 32 mph while burning approx. 13 gallons/hr. Other fun features of the boat include the twin 7,000 lumen LED flood lights from PTLX, the electronically actuated windscreen, 5 ton flush mounted pick points, and Aquatrac PVC laminated foam decking.